Studies published prior to 1980 failed to find an association between smoking and colorectal cancer, while subsequent studies reported an association after accounting for a three to four decade initiation period. 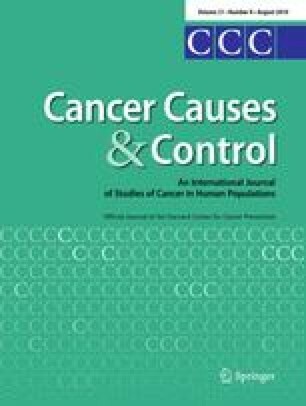 The aims of this study were to determine the effect of accounting for secondhand smoke (SHS) exposure on the association between smoking and colorectal cancer and to determine the association between SHS and colorectal cancer. Approximately 1,200 colorectal cancer cases treated at Roswell Park Cancer Institute between 1982 and 1998 were matched to 2,400 malignancy-free controls. The effect of accounting for SHS exposure was determined by comparing the odds ratios (OR) for each smoking variable in the overall sample and then for those who reported no current SHS exposure. A small, significant increase in colorectal cancer odds was noted for heavy, long-term smoking males when not accounting for SHS exposure (>45 PY: OR = 1.34; 95% CI 1.04–1.72). OR increased when the analyses were restricted to individuals reporting no current SHS exposure (>45 PY: OR = 2.40; 95% CI 1.36–4.23). Accounting for SHS exposure resulted in a substantial increase in the odds of colorectal cancer for all smoking variables in this study. Future studies should account for SHS exposure when examining the association between smoking and colorectal cancer. All authors have participated in the drafting of the manuscript and support its submission for review. This work was supported by National Cancer Institute R03-CA097780 and R25-CA102618.